This recipe has it all: juicy pan-seared pork chops, golden roasted potatoes and a generous green salad. The potatoes are boldly seasoned with mustard seed, coriander and dill and baked until tender, while almonds top a crunchy salad of blanched green beans and sugar snap peas. A honey and Dijon mustard pan sauce brightens the whole dish, which is guaranteed to satisfy appetites and taste buds alike! Preheat the oven to 450°F. Medium dice the potatoes. 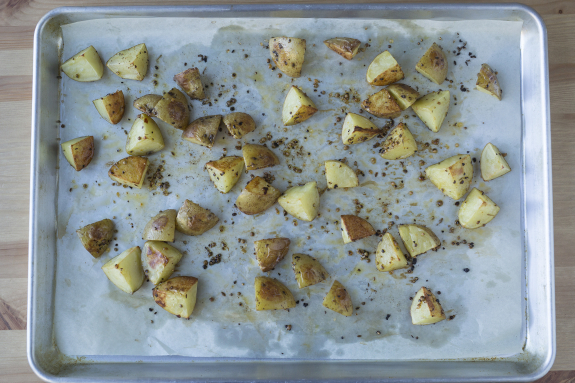 On a lined sheet pan, drizzle the potatoes with oil; season with the spice blend and S&P. Arrange in a single, even layer and roast in the oven, 25 to 30 minutes, until browned and tender when pierced with a fork. Remove from the oven and set aside in a warm spot. While the potatoes roast, bring a medium pot of salted water to a boil. 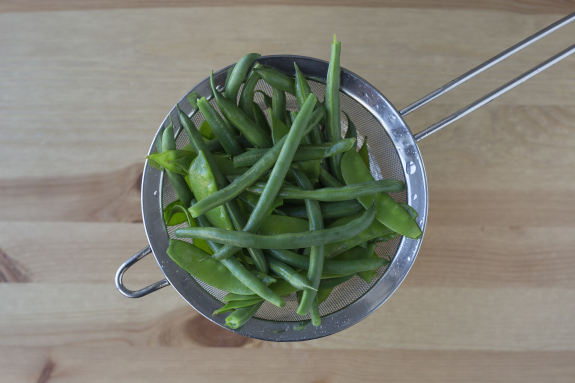 Add the green beans and sugar snap peas to the boiling water and cook, 1 to 3 minutes, until crisp-tender. Drain the vegetables and place in a bowl of ice water. Let stand until completely cool, then drain thoroughly. 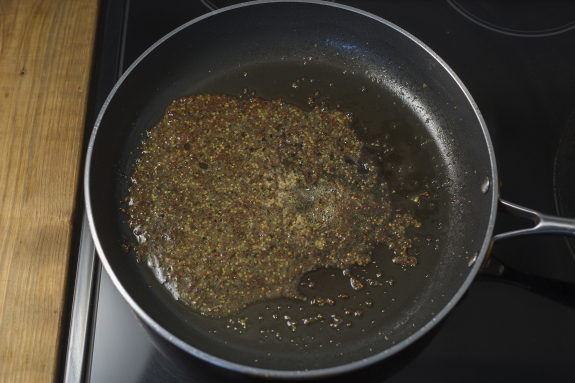 In a large pan, heat a drizzle of oil on medium-high. Pat the pork chops dry with paper towel; season with S&P. 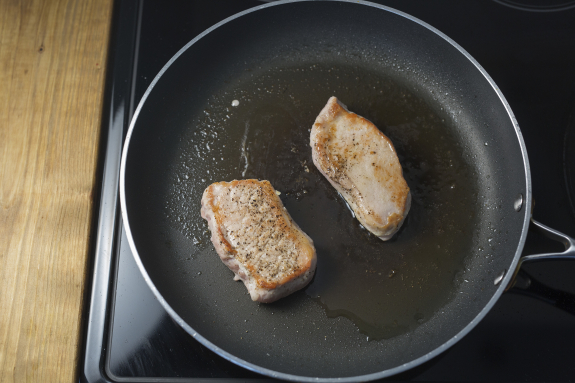 Add the pork chops to the pan and cook, 3 to 5 minutes per side or until nicely browned and cooked through. Transfer to a plate, leaving any browned bits (or fond) in the pan and set aside in a warm spot. To the pan of fond, add the honey, mustard and ¼ cup of water (double for 4 portions). Cook, stirring frequently, 3 to 4 minutes, until thickened; season with S&P to taste. In a bowl, combine the blanched vegetables, almonds, vinegar and a drizzle of olive oil; season with S&P to taste. 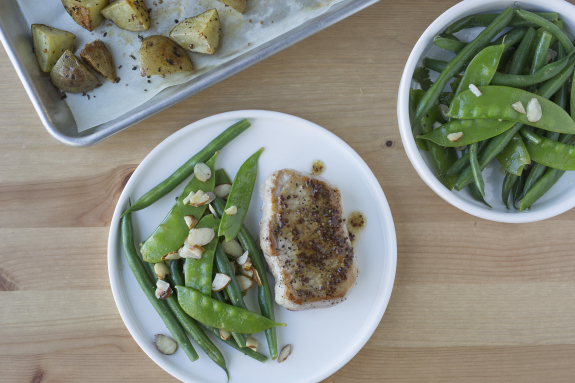 Divide the pork chops and bean salad between your plates. Spoon the Dijon sauce over the pork chops and serve the roasted potatoes on the side. Bon appétit! Health Canada recommends cooking pork to a minimum internal temperature of 71°C.